I’ve spent the better part of the past 15 years studying whether there are thresholds in habitat loss below which species and associated ecosystem processes decline abruptly. In an era when human population exceeds 7 billion and habitat in many systems is declining at unprecedented rates, are there any early warning signs of impending ecosystem collapse? Are there critical amounts of different habitat types that could be maintained to prevent such collapses? Our group has tested for such thresholds in forest bird populations in temperate North America (Oregon, USA, and New Brunswick, Canada), and in the fragmented tropical forest of Costa Rica where we are examining threshold behavior in hummingbird pollination networks. But despite the massive effort that goes into such empirical field-based studies, there is always a certain dissatisfaction that comes with a limited range of inference. Do mammals of Borneo, or salamanders of the southern Appalachians respond in similar ways to habitat loss? Are there any generalities that emerge across systems that might help us better conserve species? Unfortunately, to date, the data to permit such broad-scale inference have been limited. Although there have been excellent local-scale studies on ecosystem declines, few datasets were available at global scales. Then, beginning a few years ago, various stars aligned that allowed us to begin to test such ideas. First, in 2013, Matthew Hanson (University of Maryland) and others published global-scale data on forest loss, gain, and cover (Hansen et al. 2013). Second, the International Union for Conservation of Nature (IUCN) has continued its efforts to increase the quality of estimates for vertebrates about their ‘threat’ status. Their Red List database ranks >30,000 vertebrate species into a category of endangerment (“Least Concern”, “Vulnerable”, “Near Threatened”, “Threatened”, “Endangered”, “Critically Endangered”) based on expert assessments. Third, a group of scientists (among them my coauthors Wolf, Levi, Ripple, Phalan, Duerte, Millers) had recently assembled at Oregon State University (OSU) to form the “Forest Biodiversity Research Network” (https://www.forestbiodiversity.org) – one of the purposes of which is to engage in broad-scale synthesis of existing biological datasets to address pressing conservation questions. Finally, via a graduate course at OSU, I met Chris Wolf – a PhD student double majoring in Statistics and Forest Ecosystems; Chris is without doubt one of the best “big data” analysts and statistical thinkers I have come across. 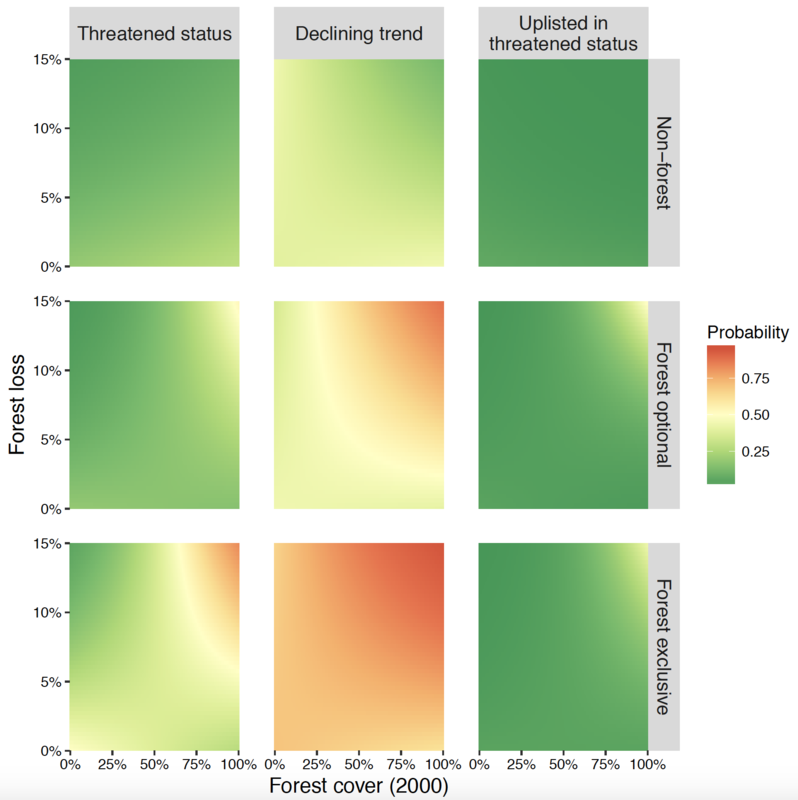 First, we conducted a simple test; could the quantitative forest loss data from Hansen et al, summarized at the scale of individual species ranges, predict threat status for forest-associated species? Although we expected a strong correlation, this need not necessarily have been the case; many lesser-known species are listed based on qualitative estimates of habitat loss, and others aren’t listed based on habitat loss estimates at all, but other stressors. The initial test was promising, overall, forest loss was a good predictor of whether the >19,000 bird, amphibian and mammal species were listed as “threatened”, whether species had recently been upgraded to a higher category of threat, and whether or not populations have been in decline (Betts et al. 2017). It then occurred to us that we could get more from these data than a simple global test of forest loss on endangerment; we could also test for threshold-type effects by modeling the statistical interaction between initial forest cover and rates of forest loss. Under the ‘habitat threshold hypothesis’ we should see amplified effects of forest loss when total amounts of forest had dropped to very low levels in species’ ranges (given my previous work, I must admit that this was the one I expected! Theoretical work going back to metapopulation theory and Andrén’s classic review in 1994 support this view). Alternatively, we conceded it was possible that rapid forest loss could exert stronger effects in relatively undeveloped landscapes. Indeed, a team led by Jos Barlow (Lancaster University) had recently found very strong effects of forest loss even in the initial stages of deforestation and development (see Barlow et al. 2016). We termed this the ‘Initial Intrusion Hypothesis’. 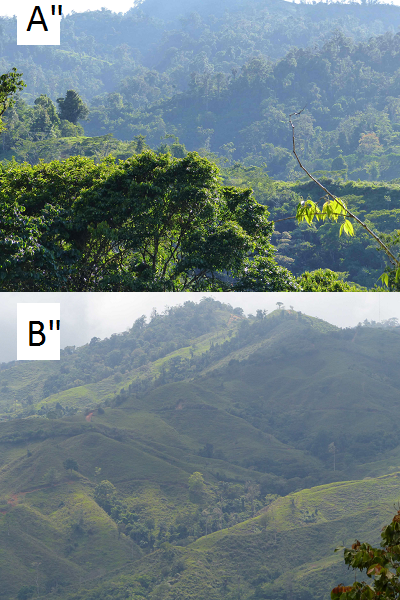 Examples of (A) a relatively contiguous tropical forest landscape near Amistad National Park, Costa Rica, and (B) a landscape with low initial forest cover. Under the ‘Initial Intrusion Hypothesis’, recent forest loss should have a greater effect on biodiversity in contiguous than in already denuded landscapes (photo credit: M. Betts). Stakes are high. If forest loss in already denuded landscapes is most detrimental, conservation efforts should focus more on protecting the remaining fragments of habitat; indeed, many previous conservation efforts have adopted this approach (see Brooks et al. 2002). Alternatively, if forest loss in more contiguous landscapes causes the most rapid declines, conservation attention should be re-focused in these areas. In support of this view are recent calls to protect large portions of the Earth’s surface (e.g., E.O. Wilson’s Half Earth proposal). I must admit that the results surprised us all! We found very little support in the IUCN data of the Habitat Threshold hypothesis. Instead, results strongly supported the Initial Intrusion Hypothesis (see Fig. 1). We spent the following several months trying to determine whether this finding was due to some oversight in our analysis. Throughout 2016 we would meet weekly and each of us would try to poke holes in the finding (and each other’s ideas… in a pleasant way of course). We conducted a slew of sensitivity analyses; was the finding due to some artifact of the IUCN Red List process? (Our non-resident expert and co-author Stu Butchart from Birdlife International guided us through this effort). Was the result due to either spatial or phylogenetic non-independence of data? Multiple approaches to spatial statistics and including taxonomic information in analyses indicated this was not the case. Fig. 1 Evidence from our paper that the effects of forest loss are most detrimental at high levels of initial forest amount. Note that for species depending partly and completely on forest (‘optional’ and ‘exclusive’ respectively) the color ramp grades toward yellow or red in the upper right corner of the panels for all three response variables ([whether or not the species is threatened; ‘Threatened status’, whether or not the species is exhibiting a declining trend; ‘Declining trend’, and whether or not a species has recently been upgraded to a higher threat category; ‘Uplisted in threatened status’). This means that the probability of all three measures of detrimental effects is highest at high rates of forest loss in relatively intact landscapes. 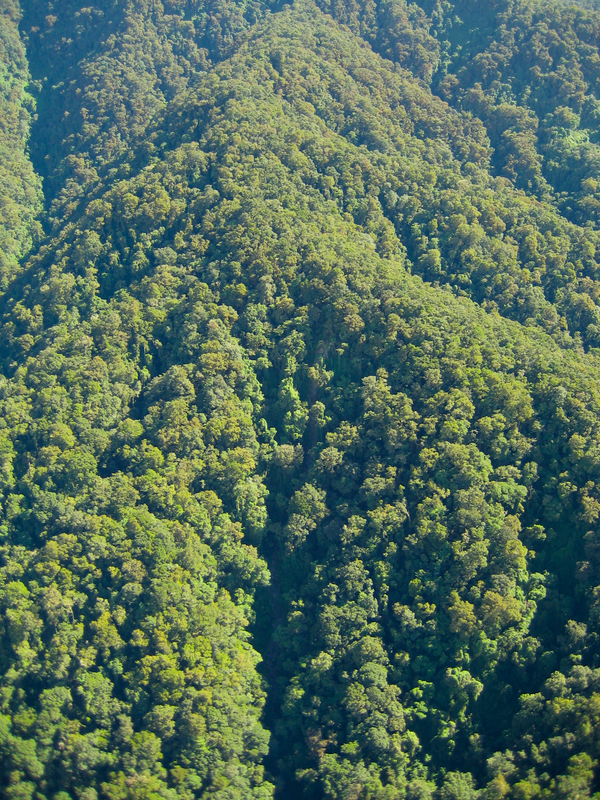 Amistad National Park, Costa Rica – an example of a relatively intact tropical forest landscape (photo credit – Z. Zahawi). Why such a strong effect of forest loss on biodiversity in the initial stages of deforestation? We think a number of mechanisms could be at work, all of which require future study. First, it is becoming well understood that initial intrusion by logging roads can substantially increase rates of bushmeat hunting (see recent paper by A. Benítez-López at al. ). Second, within a landscape, different forest types are logged at different rates. If specialists’ habitat is targeted in the initial phases of deforestation (for example, accessible high-economic-value forest [bottomland forest adjacent to rivers]), habitat will be lost at much greater rates than indicated by the overall rate of forest loss within a species’ range. Indeed, many of the forest associated Red Listed species tend to be highly specialized forest associates. For instance, the Mentawi flying squirrel (Iomys sipora) is associated with primary tropical forest of Borneo, and is so rare that Googling an image of this species yields only a drawing. All of this is not to say that we should completely ignore landscapes that have already lost substantial forest; indeed, our analysis shows that human footprint and historical forest loss are also strong predictors of endangerment. Further, for one of our response variables – species’ population declines – we actually found that high rates of recent forest loss are particularly detrimental at both high and low initial amounts of forest (see Betts et al. Extended Data Figure 5). The conservation recommendation emerging from all of this is that we need to renew efforts to conserve large, intact tracts of forest worldwide. In our paper, we estimate that we have already lost >37% of the planet’s forest. The Hansen et al. (2013) data indicate that forest is continuing to be lost at high rates (net loss of about 1.5 million square kilometers, per year – an area roughly three times the size of France [I’m not sure why France is always invoked for such comparisons]). Most of those losses occur in the tropics (where most species occur), and South American rainforests account for nearly half of global forest loss. We are somewhat optimistic that rates of forest loss can be slowed in the ‘high risk’ hotspots mapped in our study, given some recent impressive efforts to protect tropical forests. However, without substantial changes to human behavior, it may be a losing battle. Ameliorative actions include reducing the demand for tropical forest products and changing human eating habits to favor outputs that require reduced land area (e.g., less livestock). Admittedly, solutions to the problem are not as straightforward as simply locking up land. We envision future multidisciplinary efforts to help provide tractable policy solutions to the biodiversity crisis. And, yes, for me at least, the prognosis is good. I hope the same holds for the future of global forest biodiversity. Andrén, H. Effects of habitat fragmentation of birds and mammals in landscapes with different proportions of suitable habitat: A review. Oikos 71, 355–366 (1994). Barlow, J. et al. Anthropogenic disturbance in tropical forests can double biodiversity loss from deforestation. Nature 535, 144–147 (2016). Benítez-López, A. et al. The impact of hunting on tropical mammal and bird populations. Science 356, 180–183 (2017).